I love revolvers. From the time I was a young’n to now, they have a certain mystic about them. It could be all the John Wayne movies when I was a kid, who knows? I don’t own very many pistols but I was quite particular about what I wanted. 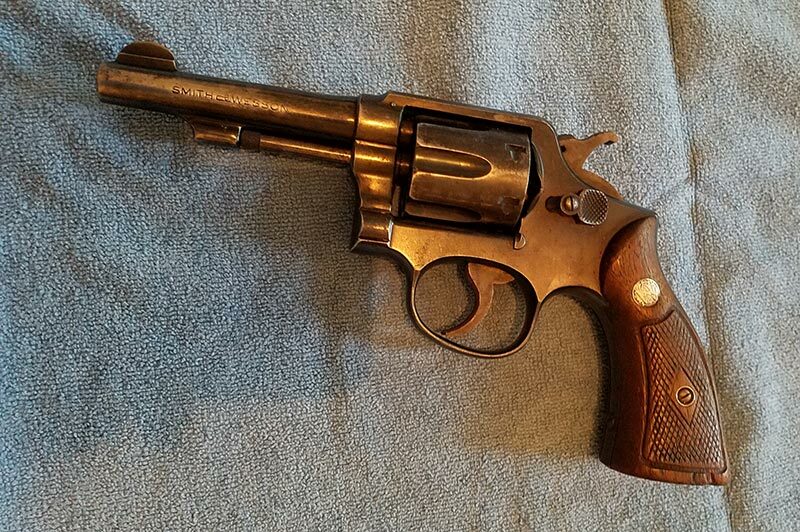 I wanted a Smith .38 Special with a 4″ barrel. The classic format so to speak. Becuase I wanted on the cheap I had been chasing this gun for close to two years. When I found one for $150 in decent enough shape at a local gun show, I pounced on it. Note: I got this gun and rescued it up before I started this site so forgive the lack of total before and after shots. When I first picked it up this little guy was a mess. 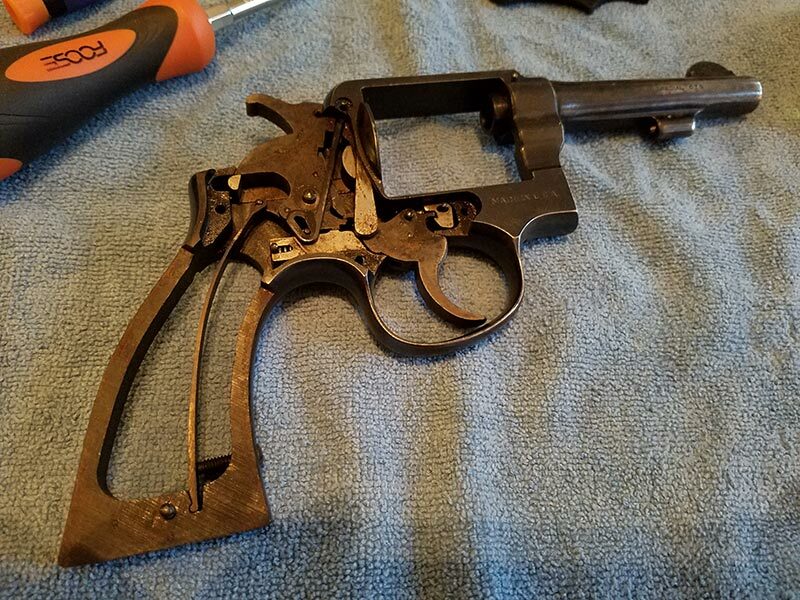 The bluing had issues along the barrel and top of the frame where it had ridden in a holster – the holster came with it but was extremely worn. The had small chips and cracks in them plus they too were very worn. Just holding the gun in your hands anyone could tell it was completely grimy. It was the right gun but needed a rescue to get it back to what I considered serviceable condition. I knew the serial was too short to be modern but not the right numbers to be really, valuable. For me, that was perfect. I sent away to Smith to have the serial dated – 1948. Again I felt it was about perfect. Post-war and the older style which suited me fine mostly – but, as always, I had to tinker with it none the less. The first thing to do was get the thing apart and see what I was really dealing with. The trigger pull felt a little raspy which worried me a little. Trying to get the side plate off I found one of the screws had been seriously boogered (which I still need to fix) and stripped from someone trying to get it out somewhere along its long lifespan. Once I carefully got that screw and the others loose, the cover plate came off. It was a mess. Dried up oil and gunk from who knows how long ago was stuck to everything. I took the pieces out one by one and got the major crud off them. I’m almost positive no one had had it open since before the age of computers. Once I got all that apart, scrubbed up a bit (above) then put it all back together it was MUCH smoother on the trigger pull. 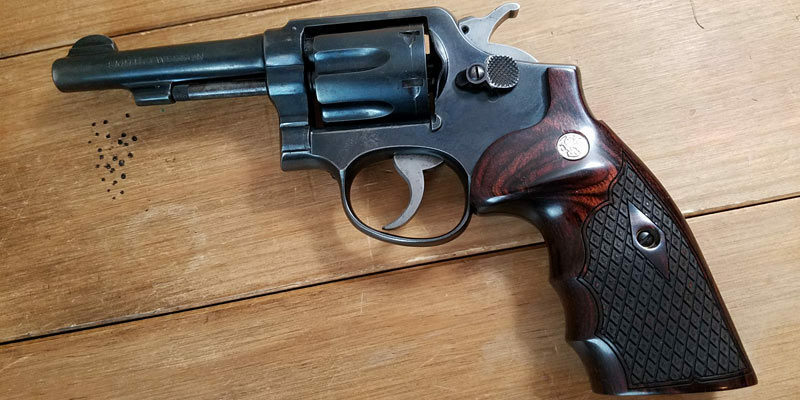 A little correctional bluing and some fat custom grips and my .38 Special was as good as new (ish) and exactly the way I had always pictured it. I got a nice piece of history that looks great and is very smooth to shoot for just under $200 after the cost of the grips was factored in.